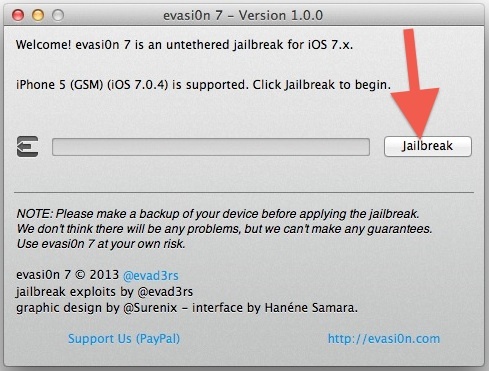 The Evasi0n7 tool provides the ability for users to jailbreak iPhone, iPad, iPad Air, and iPod touch devices running any current version of iOS 7. Experienced jailbreakers will find the tool familiar and know the process well, but for those who are less familiar with the process we’ll go through it step-by-step in a walkthrough. Note: Jailbreaking is not recommended for most users, and casual iPhone and iPad users will likely gain no benefit from completing the process. Installing jailbreaks may cause apps to crash, system apps and the core iOS experience to malfunction or behave unpredictably, and other peculiar device behavior may occur. This makes jailbreaking best limited to developers and advanced users who have a compelling reason to use the evasi0n tool, and who are comfortable with the potential risks involved. Proceed with caution and at your own risk. This guide is provided for informational purposes only. Check device compatibility before beginning. The current Evasi0n7 tool supports jailbreaking iOS 7.0, iOS 7.0.1, iOS 7.0.2, iOS 7.0.3, and iOS 7.0.4 on basically all possible hardware, including iPhone 5S, iPhone 5C, iPhone 5, iPhone 4S, iPhone 4, iPad Air, iPad 4, iPad 3, iPad 2, iPad Mini, Retina iPad Mini, and the iPod Touch 5th gen. The two beta iOS 7.1 versions are also supported on compatible hardware, but running a jailbreak on a time-limited beta version of iOS software is not recommended for anyone. Back up your device before beginning. Back it up to both iTunes and to iCloud – yes both. This is important, it provides the only way to undo the jailbreak should you want to revert back to normal and keep your settings and configuration. If you updated to iOS 7 using OTA as most users did, it is highly recommended to do a full backup and restore before using Evasi0n using the iOS 7.0.4 IPSW. This is not required, but recommended by the Evasi0n team to avoid unnecessary bugs and quirks. Turn off the lock screen passcode before beginning, not doing so may prevent the jailbreak from working. You will want to turn this back on again after it has finished. Did you back up yet? If you didn’t yet, go do that. If you can’t find the Cydia icon, the jailbreak probably did not complete properly and the process will need to be started over again. As of now, many popular jailbreak tweaks do not yet work and have not been updated to support iOS 7. If you intend on keeping the jailbreak, have patience for the jailbreak developers and tweak makers to update their packages on the Cydia Store to support the latest versions. Any questions or suggestions? Let us know in the comments. There’s also the fact that if installed on a Chinese locale then it installs bloatware and a pirated app store and by default removes cydia. It’s been rumoured that they were paid large amounts of money to include this. Also barely any of the tweaks work and they definitely won’t work on the 5S because mobile substrates hasn’t been updated for 64bit. How do I make my cracked apps work, it’s shows it’s there but it’s blacked out when I pressed it it’s says waiting then stays blacked out do I have to jailbreak it over again I go to cydia everyday so it can update but nothing changed can someone please help I have this on my iPad 2. Works every time. Enjoy your jailbreak!